We are just a mere two weeks away from the launch of Pokémon Sun & Moon and so it's time for another run down of every single thing that we know and today, we are dealing with the Pokémon. We won't be detailing the datamined leaks here, but there will be things from what has been officially revealed so there may still be spoilers - consider yourselves warned! As there are 60 Pokémon, we also won't post all the new monsters but just the most prominent ones. Once again, we have the starter Pokémon, but for the first time ever, we have their evolutions fully revealed before launch. First up is the Grass/Flying-type Rowlet. 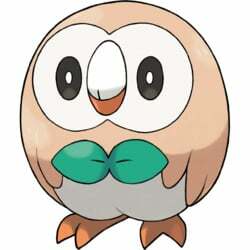 Rowlet is a cute Owl that can turn its head round. It evolves into Dartrix and then into Decidueye where it gains the Ghost-type, becoming Grass/Ghost and the first ever Ghost-type starter Pokémon. With this evolution, it gains a new move called Spirit Shackle where it shoots a leaf that does damage and prevents the opponent from escaping from battle. Its Speed is said to be astonishing. For the Fire-type lovers, there's the Pokémon Litten. Litten is a cute Fire-type cat that licks its fur in order to create flaming furballs. It evolves into Torracat and then into the buff Fire/Dark-type Pokémon, Incineroar. When it is happy, while looking cold and indifferent on the outside, it'd often be incredibly contented on the inside. It has the move Darkest Lariat which ignores stat boosts of the target. Finally is the Water-type Pokémon, Popplio. Popplio is a cute sea lion that is generally quite a performer, spending time creating bubbles. It evolves into Brionne, and then finally into the majestic Primarina, a Water/Fairy-type Pokémon and the first Fairy-type Starter Pokémon. Primarina is a Pokémon that can create many songs, with songs differing based on the region it is from. It has the special move Sparkling Aria which does damage but can even heal the Burn condition off of the target. The Pokémon of the Alola Region are among the most unique and unusual that any generation has brought. Rather than rattle off a list of all the Pokémon, let's just discuss some of the more notable ones. First up is Mimikyu. 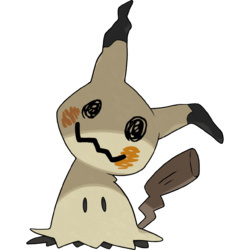 Mimikyu is a Ghost/Fairy-type Pokémon whose true appearance is not known. Instead, after 20 years of Pikachu being loved by everyone, it too wanted to be loved so created a disguise to look like Pikachu so people could love it too. This disguise is actually its ability, essentially giving a free substitute. Wishiwashi is an unusual Pokémon. 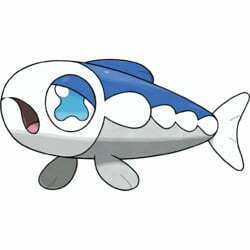 It's pure Water-type but once it reaches a certain level, at the start of battle it transforms into a School Form, having called many fish to create this big and menacing fish. However, if Hit Points get too low, the fish will scatter and it will become its Solo Form. This will make it an incredibly interesting Pokémon to use. 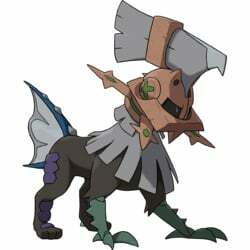 Type: Null is a rather unique Pokémon. It was created out of parts of other Pokémon to defeat Legendary Pokémon, but its powers were held back by its helmet. Once it evolves, it becomes the Pokémon Silvally which removes the helmet and can unleash its true powers. With the use of various items, it can change its type to be any of the 18 types and even has an attack that changes type. It is used by the Team Skull enforcer, Gladion. 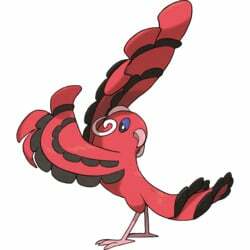 Oricorio is a unique Pokémon in that it has four different forms, one for each island in Alola. By eating the nectar on each island, it can change forms. These forms completely change the type of it to Fire, Electric, Psychic or Ghost, as well as the Flying-type. Oricorio is a dancer and so has a unique ability where if another Pokémon uses a "Dance" move in battle, it will also use that move! Rockruff is a cool early Pokémon that you'll find. It's a pure Rock-type Pokémon whose collar looks like a Z Ring. 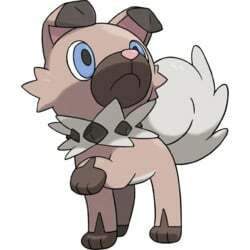 However, as cute as Rockruff is, the interesting part is its evolution. Lycanroc is a unique Pokémon in that it has version exclusive forms. If Rockruff evolves in the day of Pokémon Sun, it evolves into its Midday Form while if it evolves in the night of Pokémon Moon, it evolves into its Midnight Form which resembles a werewolf. Each form has different abilities and even different movesets. There are so many other cool Pokémon that can be listed here, but we'd just go on for hours and hours and hours. 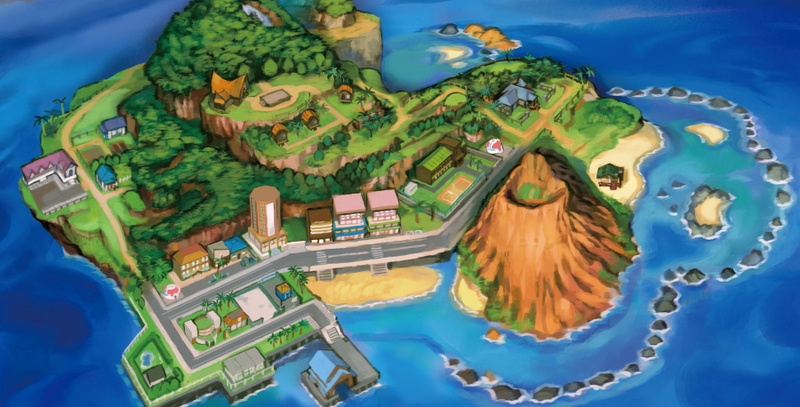 A new feature in this game are Region Forms - in this region they are Alola Forms. These are Pokémon that have adapted to the climate and living conditions of Alola, changing their appearance, type and movepools. There are 14 officially known Alola Form Pokémon, all of which are from the Kanto Region. First up is Alolan Rattata and Raticate. They are Dark/Normal-type and live in urban habitats. Also Dark-type are Meowth and Persian, which had been bred specifically for the Alolan Royalty. Grimer & Muk are now Poison/Dark-type and adapted after being brought in to deal with the garbage problem of Alola. Some Pokémon have also become Ice-type to adapt to the circumstances. Sandshrew & Vulpix have both become pure Ice-type while Sandslash & Ninetales have become Ice/Steel and Ice/Fairy respectively, a huge change to how they were initially. Some Pokémon have got their regular forms, but their evolutions are the ones that change. Cubone will now evolve into Alolan Marowak, which is Fire/Ghost-type which changed type to deal with the Grass-type predators of the Alola Region. Exeggcute will evolve into Alolan Exeggutor, the hilariously tall Grass/Dragon-type Pokémon which many consider to be the true form of Exeggutor considering it developed this form when exposed to strong sunlight. Pikachu also is in the game and evolves into the new Electric/Psychic-type Alolan Raichu, which surfs on its tail in mid-air. Nobody knows why Raichu changed, but it is speculated that it's just because it ate a lot of pancakes. Legendary Pokémon have been somewhat changed up this generation. 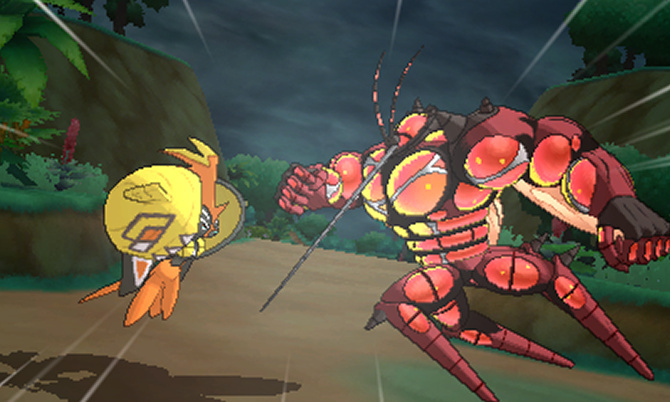 In Sun & Moon, each island Pokémon has got a Guardian Deity which chooses the Kahuna of the island and helps protect it. 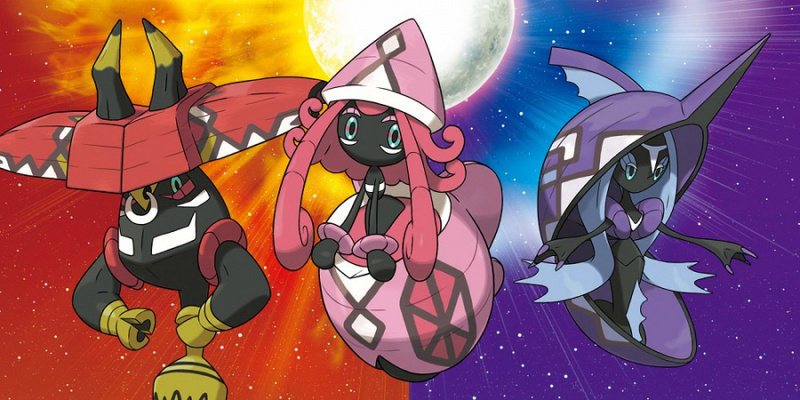 There's Tapu Koko, the Electric/Fairy-type guardian of Melemele Island, Tapu Lele, the Psychic/Fairy-type guardian of Akala Island, Tapu Bulu, the Grass/Fairy-type guardian of Ula'ula Island and Tapu Fini, the Water/Fairy-type guardian of Poni Island. Each guardian comes with an ability to activate their respective terrains which makes them a very interesting force in battles. Back on the standard Legendary Pokémon, players of Pokémon Sun will encounter the Psychic/Steel-type Pokémon, Solgaleo, the lion that protects the sun while players of Pokémon Moon will encounter the Psychic/Ghost-type Pokémon Lunala which protects the Moon. These Pokémon are both unique and have special appearance changes when they use their special moves. Finally, we have the Mythical Pokémon, Magearna. Magearna is to be distributed via QR Code at some point in the near future. This Pokémon is Steel/Fairy-type and was created over 500 years ago by humans. Ultra Beasts are a mystery. They're technically not classed as Pokémon, but there are so many Pokémon-like features to these that they can't be ignored in the list. Ultra Beasts are from another dimension and come in to ours through a wormhole. Only three Ultra Beasts are currently known, UB-01, which is a strange jellyfish seen appearing through the wormhole in front of the hero, Hau and Lusamine. UB-02 Absorption is exclusive to Pokémon Sun & UB-02 Beauty is exclusive to Pokémon Moon and both appear on Melemele Island, facing off against Tapu Koko. 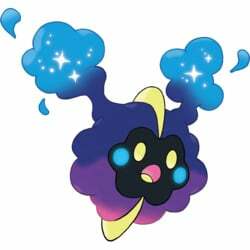 What types they are, any abilities, their movesets and if you can even capture them remain officially unknown at this time. For a moment I thought you'd used fanart without citing a source. Good job, @NintendoLife, looks like you have some journalistic integrity left in you. I'm so excited for Sun and Moon. Rowlet and Rockruff will be mine! Ahhh! This article is getting me too hyped!!! I can't contain myself for these 17 days left. They're killing me! PLEASE fly by faster. I'm getting the duel pack so once I beat the story mode in both which will hopefully take me a while I can complete dex and such on my own. Can't wait to experience the alola region with you all it's gonna be one heck of a ride! Gonna pick Popplio because I love its final form. I hope you guys have received your review copy of the game. I don't want a rushed play-through and crappy review like IGN. Leaning towards picking Rowlet as my starter! I still get a kick out of the line that they think Alolan Raichu exists because of pancakes. I can't wait to learn the origins of Type:Null, Sun and Moon are going to be GREAT! These new games seem amazing! November 18th won't come fast enough! 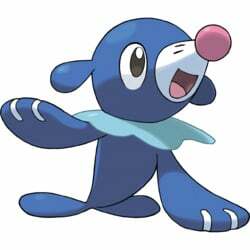 I thought Popplio was a male, but I was wrong. Next evolution revealed that she is a female. Anyway, I will find Sawk when I get the game. @Anti-Matter Popplio isn't "a" female. 12.5% of them are, tho, just like any other starter Pokémon. 17 days left! So hyped for these. Got my Sun preorder in August. I can't wait. I'm still putting my team together, but I know I'm getting Primarina. I've been team Popplio ever since the reveal of the starters due to his silly nature and the backlash he got... and I regret nothing since Primarina's design and fairy typing are awesome. The only other Pokemon I know I am getting as of now is Palossand. I think he's hysterical and I've always wanted a sandcastle Pokemon. There are a lot of other Pokemon that interest me but I'm not sold on anyone else just yet. I'll either wait until we found out how early we can obtain each Pokemon or until I run into each Pokemon in my actual play-through. I'm definitely going for Litten, I've always been a firetype trainer and always been the strongest trainer out of my friends. 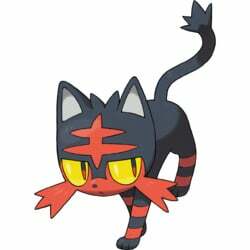 I'd love it if Litten had good speed & physical attack, there is ALWAYS room for a good physical sweeper. I'm getting sun, the wife and kid getting moon, Rowlet will be my first grass starter, I cannot wait!!! All that's left if for the ability to transfer all my Blue Pokemon over to this game and the Switch tech specs! I so hope UltraBeast won't be catchable and actually be super strong bosses. I'll start with Litten, but eventually catch them all. I believe the ultra beasts will be catchable, could be wrong. Actually don't know that much about them as I've avoided most reveals. I quickly scrolled past most of this article so I wouldn't see the all the new mons. So I'm guessing Null is Pyramid Head's pet? @serebii isn't sandshrew ice/steel as well? Pikachu, Popplio, Alolan Marowak, Event Munchlax, Rockruff, and jangmo-o, that's my Alola team. Does anyone else notice how the trial captain Mallow is basically a girl version of the Unova gym leader Cilan?